Founded in 1670, Charleston, SC, oozes personality, with its Southern charm, secret gardens, and Caribbean and New Orleans influences. The city and port sit on a peninsula where the Ashley and Cooper rivers converge, about 100 miles south of Myrtle Beach, SC, and 100 miles north of Savannah, GA. The city itself is a “living museum.” Many important historical sites are within walking distance of the cruise pier – located conveniently downtown. For example, the city's Old Market is just two to three blocks from the cruise terminal. (For more details, see our related SouthernTravelNews.com™ story about Charleston's Old Market). Activities for cruisers are plentiful. You might search for treasures at the market. Or, you might secure passage on a day boat to Fort Sumter in Charleston's Harbor; there the first gunshot of the Civil War was fired. Other options include touring historic sites or antebellum plantation mansions. Many cruisers simply prefer to walk through the colorful downtown historic district, lined with tall, narrow stucco houses with wooden shutters and ironwork balconies. Or, just take a carriage ride from the stand adjacent to the Old Market. Among the sights? The elevated walkway (shown at right*) near the Battery offers a great spot to view both the harbor and the city's so-called "Rainbow Row," a grouping of colorful, historic homes. The Charleston CVB’s (www.charlestoncvb.com/pdf/activitiesmap.pdf) activities map offers more suggestions. If you’re driving, the Port of Charleston's cruise terminal (shown below*) can be reached via I-26 and Highway 17. Visit the South Carolina State Ports Web site (www.port-of-charleston.com/cruises/driving_directions.asp) for directions. The secured lot is only open to cruise passengers embarking from the port. The site is secured and patrolled by the Port Police during the cruise. .
A complimentary shuttle operates between the parking areas and terminal on embarkation and disembarkation days. For ALL oversized vehicles over 20 feet in length (such as recreational vehicles, campers or buses), the storage fee is $48 per day. The total storage fee is due when the vehicle is left in storage. Cash, credit cards, traveler's checks or personal checks are accepted. Checks should be made payable to the S. C. State Ports Authority. Checks written on non-U.S. banks and financial institutions are not accepted. A color-coded claim ticket will be given to the driver when payment is received. The color-coded ticket will help identify the storage area on the return date. If you’re arriving by air, Charleston International Airport (www.chs-airport.com) is just a 12-mile cab ride from the terminal. The half-hour ride costs approximately $27. On disembarkation day, cruisers heading to the airport or elsewhere within the city will find a line of cabs waiting for them. Once you arrive at the cruise terminal, you’ll discover an 18,000-square-foot embarkation facility. Passengers have access to an elevator, luggage carts and hand trucks. A covered, U-shaped passenger drop-off area provides direct terminal access. Many restaurants are just a few blocks away in the city. In 2010, Celebrity Cruises' Mercury will offer 10-night voyages to the Caribbean from Charleston as well as one transatlantic repositioning cruise. 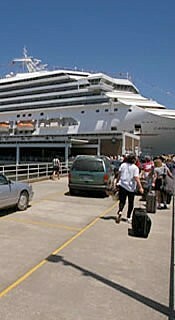 Other cruise lines and ships also visit Charleston on port calls. Lizz Dinnigan is a freelance writer and copy editor for SouthernTravelNews.com™ and SouthernCruising.com™. She is the former associate editor - cruise for Travel Agent Magazine, a major national weekly trade publication. *Photos are owned, copyrighted and used courtesy of Susan J. Young or the South Carolina Ports Authority. All rights reserved. Please do not link to nor copy these photos. Thank you.